Studies show that kids who learn basic science concepts in everyday English and then go on to learn the scientific terms for them, can understand them more easily than their peers who are introduced to science concepts in the traditional way. 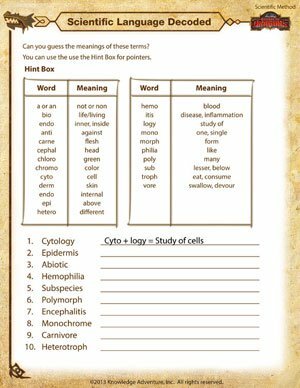 Use this printable scientific method worksheet to decode scientific language. And don’t forget to check out other scientific method worksheets on School of Dragons!